William F. Cody: born 1846, died 1917. Worked as a Pony Express rider, stagecoach driver, hunter, and scout for the U.S Army. 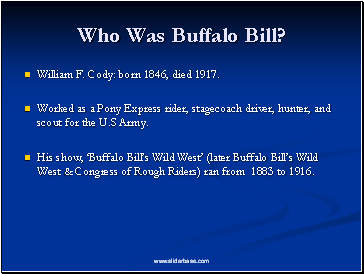 His show, ‘Buffalo Bill’s Wild West’ (later Buffalo Bill’s Wild West & Congress of Rough Riders) ran from 1883 to 1916. Buffalo Bill wrote his autobiography in 1879. In order to understand him, it is important to understand his book, and the scholarly discussion surrounding it. The common assumption is that someone else wrote the book for him, probably the same person who wrote the scripts for his shows. However, some scholars question this. They point to the book’s peculiar style. “With its hybrid style, now reportorial, now novelistic or folkloric, the Autobiography presents Buffalo Bill as both an authentic participant in frontier affairs and a consummate showman”. 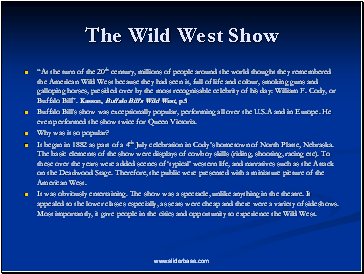 Joy S. Kasson, Buffalo Bill’s Wild West: Celebrity, Memory and Popular History, (New York 2000). 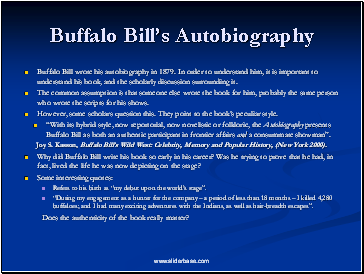 Why did Buffalo Bill write his book so early in his career? Was he trying to prove that he had, in fact, lived the life he was now depicting on the stage? Refers to his birth as “my debut upon the world’s stage”. “During my engagement as a hunter for the company – a period of less than 18 months – I killed 4,280 buffaloes; and I had many exciting adventures with the Indians, as well as hair-breadth escapes”. Does the authenticity of the book really matter? 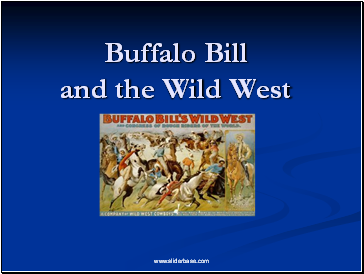 There were plays and dime novels about Buffalo Bill before he began producing his own show. He had already become a character in popular culture. “I never felt more relieved in my life than when I got out of the view of that immense crowd”. 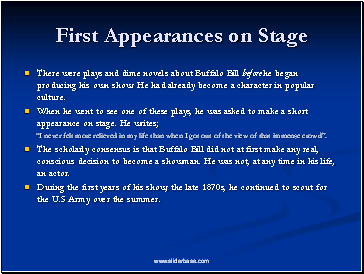 The scholarly consensus is that Buffalo Bill did not at first make any real, conscious decision to become a showman. He was not, at any time in his life, an actor. During the first years of his show, the late 1870s, he continued to scout for the U.S Army over the summer.